I HAD A BOSS with a seriously sweet tooth. For a fit bugger, he could be brought to his knees with a jar of jelly beans and would swing you a pay rise on the promise of sponge cake with jam and real cream. 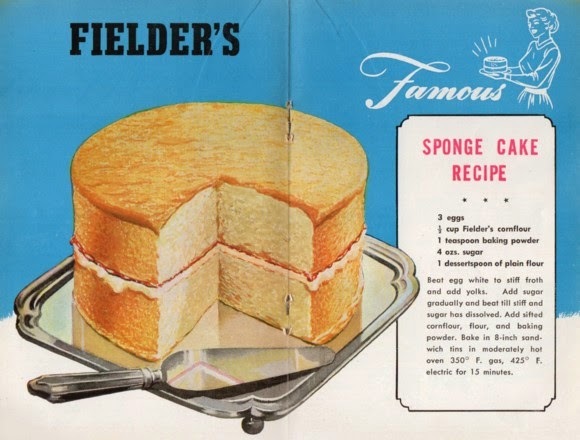 The Fielder's 'Famous' Sponge Cake Recipe would have, no doubt, tempted and according to Wheat Industries Australia's booklet of recipes, using Fielder's cornflour would have won 'me honours for my beautifully light sponge'. I wonder if Fielder's was the secret to the winning entry at this year's Sydney Royal Easter Show or whether it gets a mention in the recently launched Blue Ribbon Recipes: Prize winning recipes from the Sydney Royal Easter Show. Either way, an oldie is a goodie and with a birthday in our household today, I'll get my sponge-making mojo on and give this one a try.